Will start with a couple of oldies but goodies. I've come to believe that Cappellano may be the most age-worthy Barolo around. If not, neck and neck with Monfortino. 1958 Cappellano Barolo - I've been lucky enough to have this wine three times. I think its the most consistently great wine from 1958 that I've had, with really consistent notes each time. I'll also add that it was the WOTN [wine of the night] at a recent Cappellano vertical that I was at with a few folks from the board. It’s just perfect, impeccably balanced. Has that ethereal nature that the best old Nebbiolo provides. Dried cherries, menthol. I think it’s a wine that may never die. And one of my all times greats. 1954 Cappellano Barolo - did I mention I love Cappellano? The 1954 was in a different place from the 1958. At the end of its run, but what a great run it must have had because it was still lovely to drink, just didn't have that backbone that I've always enjoyed in the 1958. A wine that to me smells like autumn. It’s a descriptor I like because it makes me think of leaves on the floor, dried leaves. And tobacco. Totally tertiary, a real sensory experience. 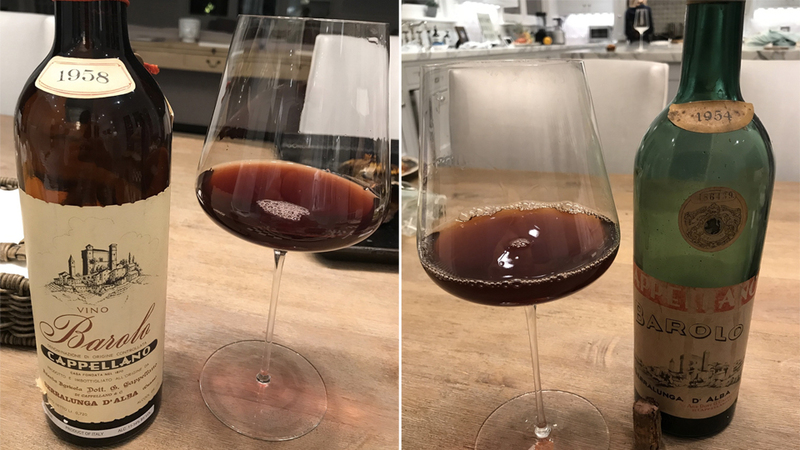 1955 Aldo Conterno Barolo Riserva Speciale - I spent some time emailing with a few of the folks here about this last week, trying to figure out exactly what it was. There is always a bit of mystery about the "pre split" Aldo wines. 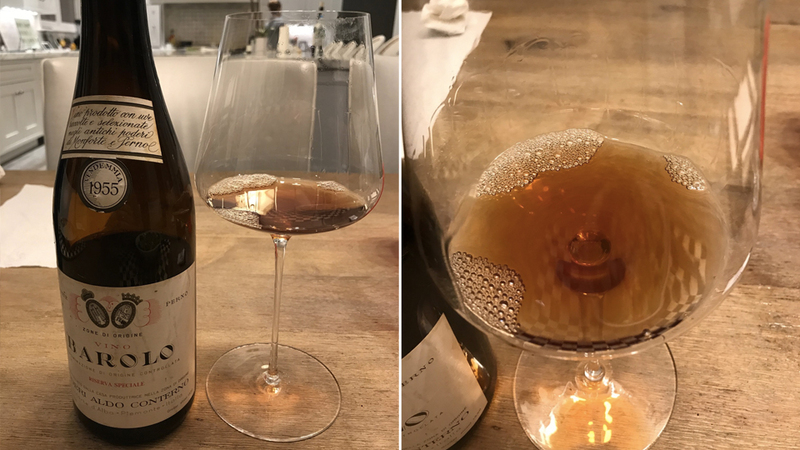 After much discussion, we came to the conclusion that it’s likely the same wine as the Giacomo Conterno Barolo Riserva Vini Pregiati, which would have been stored in brenta and then split among the brothers to bottle separately. Either way, these wines can be great values, because they are generally much less expensive than the equivalent G. Conterno labelled wines. That all being said, this was absolutely delicious. I did a better job with the photo here because I took an overhead where you can really see how translucent the wine is. Similar to the 1954 Cappellano in profile and really expressive on the nose with dried fruits and leather. Elegant on the palate. Classy beautiful wine. 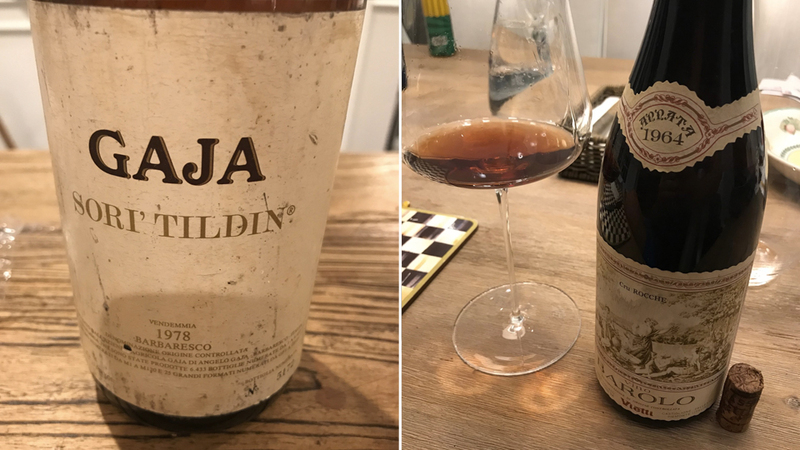 1967 Aldo Conterno Barolo Riserva Speciale - I'm not sure who Fabrizio Moscone was, but he had a really nice wine made for him! Again, a pre-split wine, again excellent as many well stored 1967s can be. Still lively, great dried fruit and tertiary notes. Not a world-beater, but a really nice solid drinking wine. Lest you think my luck is all good, think again. 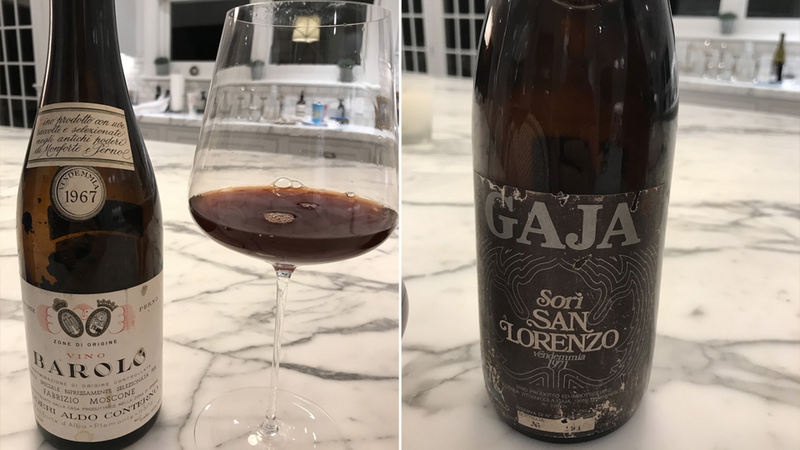 A pair of heartbreaking Gaja wines, especially the 1971, which is one of my all time favorite wines from Piedmont. Both loose corks and DOA [dead on arrival], oxidized. 1964 Vietti Barolo Cru Rocche - this was one of the only vintages of this wine that I didn't get to taste at the Vinous retrospective a few years ago and was the first time I tried it. The bottle was in perfect shape, cork intact nicely. Gorgeous translucent ruby color. You can't make this stuff up, I love that color on old Nebbiolo. On the nose, classic elegant red fruit notes. Clove and licorice. Balanced on the palate. A really nice wine. That's it for the moment, will pop back for some more notes soon.